I love the term ‘scoreboard journalism’ which was originated by then-AZ head coach Co Adriaanse in 2003. The imposition of a narrative after the fact is something which I have always been fascinated by and Adriaanse’s term describes this perfectly. I’d like to use this blog to explain the term’s origins and tomorrow I will explain why I think it is appropriate to name my blog Scoreboard Journalism. In order to do this, I would like to look first at Adriaanse himself, a true character of Dutch football. Co Adriaanse is a 65-year old football trainer who had a relatively undistinguished career as a defender for FC Volewijckers and FC Utrecht. Like many of his contemporaries from the 1960s and 1970s, his career as trainer has been much more successful than his time as a player. 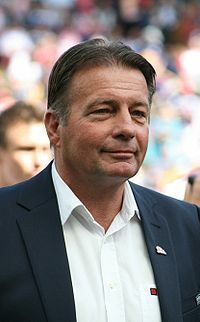 He won promotion to the Eredivisie with both PEC Zwolle and FC Den Haag in his first two coaching jobs before spending five years between 1992 and 1997 as director of the Ajax youth set-up under Louis van Gaal. Adriaanse’s youth team prodigies played a major role in the 1995 Champions League victory and in helping Ajax reach the final of the same competition a year later. After Ajax, Adriaanse went back to being the head coach of a smaller club, Tilburg’s Willem II. In Adriaanse’s first season, Willem II improved their Eredivisie ranking from 15th to fifth, their second best season ever and qualification for European football for the first time in 35 years. A year later, at the end of the 1998/1999 season, he steered Willem II, a team usually involved in the relegation battle, to second place in the Eredivisie and a Champions League place. A season later, Willem II fell to mid table and Adriaanse resigned and later went back to Ajax, this time as head coach. It was at the Amsterdam club that the fun started. Ajax finished third in Adriaanse’s first season, their best finish for three years, but he was sacked in November 2001 despite the club topping the Eredivisie at the time. Part of the reason for his departure was thought to be statements like “a good horse does not make a good rider”, referring to Marco van Basten, a potential addition to his coaching staff at the time. However, recent results had also been poor and he was not popular with fans or media due to the playing style he had chosen which moved away from the 4-3-3 ideal historically practiced by Ajax. A year later, Adriaanse was back in charge of an Eredivisie club, Alkmaar’s AZ. Again, he was very successful with a smaller club, taking AZ into Europe for the first time since the 1980s and even managing to reach the semi-finals of the UEFA Cup before losing to a goal in injury time of the final period of extra time. The third place AZ managed in the Eredivisie in Adriaanse’s final season was their best finish since 1981/1982. However, it was his phrases; “evening footballer”, “cheese viewers” and, of course, “scoreboard journalism” which brought him just as much attention. Scoreboard journalism referred to an Eredivisie match in November 2003 which AZ lost 5-1 at home to Roda JC. When asked by Dutch TV for his reaction after the match, Adriaanse said that his team had had the better chances, should have won the match easily and that Roda had profited from AZ’s negligence. He added that anyone wanting to conclude that AZ had been outplayed would be guilty of scoreboard journalism. This video of the first half highlights (AZ in red) suggests that he had a point (look at the first goal which the scorer later admitted was meant as a cross). I have added the second half too for completeness, a half in which Roda increased their lead from 1-0 to 3-0 within seven minutes of the restart. Tomorrow’s blog will explain why Adriaanse’s phrase is appropriate for what I aim to do here. Postscript: After leaving AZ, Adriaanse took over at FC Porto where he won the Portuguese double. He has since been in charge of clubs in the Ukraine, Qatar, Austria (where he won the title) and finally, FC Twente in the Netherlands who sacked him at the beginning of 2012 despite FC Twente lying in third place in the Eredivisie at the time, and Dutch Super Cup victory under Adriaanse. This entry was posted in Uncategorized and tagged Adriaanse, Ajax, AZ, Eredivisie, Scoreboard Journalism, Willem II. Bookmark the permalink. While Ajax is my 1st team I also follow Benfica and I remember Adriaanse well, aside from his time in the Eredivisie, when he was with Porto and beat out Ronald Koeman’s Benfica, who were a disaster that year. Keep up the good work Simon. Look forward to the next piece.